Heartworms can infect your dog without you knowing it. The best way to protect your dog is to prevent heartworm disease  the risk, expense, and emotional toll of treatment are significant. 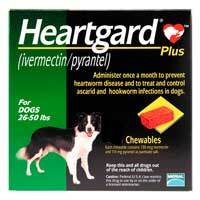 HEARTGARD Plus is the veterinarian’s #1 choice for heartworm disease prevention in dogs1. HEARTGARD Plus used monthly as directed can help prevent heartworm infection in your dog  and can help your dog avoid the risk, stress, and long periods of confinement that go along with treatment for canine heartworm disease. HEARTGARD Plus is made with real beef  dogs love the taste. HEARTGARD Plus is available in three dosage strengths for dogs of different weights. Your veterinarian will select the dosage that’s right for your dog. HEARTGARD Plus: Easy to Give. Protection to Live.